The anime has won multiple awards including "Best Screenplay," "Best Television Series," and "Best Character Designs" at the 5th Tokyo Anime Awards, an award in the "Domestic Digital Contents Category" at the 20th Digital Content Grand Prix, and the "Best Female Character" and "Best Television Series" during the 2006 Anime Expo SPJA Awards in the US. While enduring one of my anime-deprivation periods, I saw Eureka Seven with a high rating. I said why not and proceeded to get all of its 50 episodes. I started watching it only recently, after going through Ergo Proxy. Upon opening the first episode, I went o_0 then 0_0 instantly! Eureka Seven has a great OP and accompanying music! This promised to be a great anime. I could not resist going on after seeing the first episode. I can say I went through the episodes like a breeze, almost refusing to stop! So, let me just say it here, loud and clear: Eureka Seven is DEFINITELY THE BEST ANIME I HAVE SEEN! It was a total addiction to me, and it still is! Bear with me, this review will be quite lengthy! Eureka Seven (E7) really deserves it anyways! The animation of E7 is really, and I mean it, really impressive! The characters are extremely well drawn. Not your general, wide-eyed anime models but they are definitely well made. Their features are very well-detailed and their appearance is very good. Their clothes are futuristic and kinda cool in a way. E7 involves mechas, and as you could expect, they are quite stiff and roughly drawn. NO! They are the opposite! Their designs are well-polished and smoothly drawn. Here too, the features are very well-detailed. The motion of both characters and mechas are extremely smooth and not glitchy, specially considering that E7 involves something called "reffing" which resembles snowboarding. Even at the apex of fast-paceness, the motion is real smooth. The characters' movements are natural and not robotic and their poses are very human-like. Granted, the mechas look a bit like Evangelion's or perhaps even RahXephon's. But in E7, they are well coloured, and in my opinion, better designed. In a way, the way the characters were designed represent their personality. I'll leave it at that without elaboration. Go find out for yourself! Now, the backgrounds and sceneries of E7 are again impressive. Well detailed, well drawn, good play on lighting and atmosphere gives them a truly unique feel. You won't be seeing much scenery anyway, as most of the scenes will be above clouds. But when you do see real scenery, it's nice! They vary from the lively towns, to lush and wild nature and colourful flowers, to the dark and grungy industrial zones and to the dark, moody and emotional scenes. The transition between these scenes is so smooth that you rarely notice that you have suddenly changed decors! The light works was well done and will give more life and vividity to scenes. Notice the rock textures and how light is used to bring out the relief. The people at BONES have done something very good here. The greatest part of the animation lies in the battle and action scenes, particularly those involving the characters "reffing". The action is so smooth! There are no robotic movements, even when the action is at its climax and everything is going fast. No blurs, no glitches and no flaws! Great!! And also, there are almost no frame re-use except for flashbacks (there are not many). Take for example, in Shaman King. Yoh is always seen summonning Amidamaru and this scene is in most episodes. Here, you won't find such repeating scenes often. Even if there are some repeats, they are different in their own ways. I don't usually pay much attention to sounds and music in animes. Story, characters and animation usually get my attention. With E7 however, things are different! The OST for Eureka Seven is much varied from hard rock to electronic music! The OP music was great and I really enjoyed the music. However, the best song according to me, remains Storywriter by Supercar! I long to hear it again and again, and it has made it to my top favourites! It makes a really great accompaniment for action scenes, trust me. Yeaaaahhhhhh! The techno beats you hear during fights or the rock you hear during major events are g.r.e.a.t!!!! E7 makes heavy use of music since there are lots of action scenes. However, for every scene, whatever it is (emotional or fast paced), the music chosen is right! It really highlights the scenes and make them so much more interesting! Definitely a good choice of music in E7, and definitely worth a listen! Sound effects too are present and nicely integrated into the scenes. Notice the wind "whoosshhh" when the chracters are reffing, and the sound of flapping clothes. It gives added realism to the scenes. Sometimes, you can hear accompanying explosions after a major bang! It's nice to note these, just for added realism. The voice actors did a pretty good job too! However, for some characters like Anemone or MoonDoggie, you can have some difficulty to understand them, due to their accents. Anyway, it's not a real problem if you got fansubbed episodes, or subbed DVDs. Eureka Seven starts with our main male character, Renton aged 14 in his hometown of Bellforest, enjoying his life, albeit 14 years of boredom as he mentions. One day, a huge robot (an LFO) crashes in his grand-father, Alex's workshop. Out of it emerges a beautiful young girl, our main female character, Eureka. Dumbfounded by her beauty and mysteriousness, Renton is immediately love-struck. However, the millitary was pursuing Eureka. Eureka is a member of GekkoState - a sort millitia/anti-government, non-conformist reffers group, led by Holland. Eureka must return to GekkoState at all costs. However, Holland had another mission - to get the Amita Drive from Alex, a device developed by Renton's late father and world hero, Adrock Thurston. To help in Eureka's escape, Renton grabs his reffing board and tries to deliver the Amita Drive to Eureka who is now escaping in her LFO, the Nirvash. Inspired by his all-time hero Holland, Renton would like to join GekkoState to train as a mechanic. Holland, accepts (although not very gladly), and so Renton becomes GekkoState's youngest member, and his adventures and romance now start. Some main characters are Talho, main pilot of GekkoGo. Holland, the commander. Ken-Goh, the weapons expert. Stoner, photographer and editor of Ray=Out magazine which is very anti-government and was hence banned. Hap, second commander and Holland's friend. Misha, the on-board doctor. Jobs and Woz, the ship engineers. MoonDoggie, catapult operator and secondary pilot. Gidget, communications operator. Hilda and Matthiew, LFO pilots. And Renton and Eureka, Nirvash pilots and main characters. And also, the Nirvash LFO can also be considered a character at the end of E7. Ok, my description is not very great but story is really one of the greatest strengths of E7. The plotline is really complex and deep. Agreed, you have one main plotline that runs through the entire series. However, what is interesting is the way that plotline is explored from various angles and according to various characters' point of view. This gives an added understanding of the plotline. You will also see many innovative things like Trappar Particles, LFO's, Reffing, Amita Drive, and Coralians! Indeed, it's a very elaborate plotline. Interestingly enough, you will sometimes find the plotline diverging to explore various side characters' stories eg. William B. Baxter's story. Don't worry, it's here for a purpose - that is of explaining the global situation from different people's perspective. The story runs very deep, exploring such things as war and conflicts between friends, companionship, unfaltering loyalty, indomitable will to protect, duty, love, sense of justice, and the loss of close-persons. Sometimes, the emotions get real heavy and the sensitive views might be moved to tears, no joke! It can become very heavy and emotional sometimes, specially scenes involving the above-mentioned. It's a very well detailed plotline, with many interesting twists that add spice to an already very interesting story. It's a good blend of romance, action, mecha and adventure. Definitely my type! Through the course of the story, you will have the opportunity to explore the characters' past and get to know them better. You won't find many loopholes or dark points here as everything is well explained. Expect emotional warfare, painful pasts, jealousy, self-sacrifice, the death of companions, inter-crewmate conflicts and resolutions of conflicts by various ways according to the characters, added to some good philosophies about love and the other things I mentioned! It's a nice lesson in a way. The plotline offers no boredom since the characters constantly change and adapt, specially on the emotional level. I like the way the twists in emotions are introduced. It's subtle, but really present. E7 is really a great piece of work and you will see lots of unexpected things. Pay close attentions to the play on words. The GekkoState assault on Capital Hill really got me stuck. P.s. Why 9.9 and not 10? Because some important events got left out of the explanations. You could guess what they were, but an explanantion would have been easier. That's why I substracted 0.1 marks! Anyways, let's start by our main character, Renton. He's what you will call a normal guy. No super-powers a-la-Bleach here. No, he's just normal, leading a normal life. However, he is still the son of Adrock Thurston, the guy who saved the world. Quite a name to carry around. Renton gets accepted on GekkoGo (GekkoState's ship). Now, this is not what he expected. Holland is kind of a slave-master! He kinda get beaten up, get used as a.. duh slave, and things like that. Life's not all pleasant for him, all because Holland is... jealous! LOL! No joke! Anyways, E7 beautifully illustrates his development through it's 50 eps, going from a not-worth-anything to the.. (Spoiler. Cannot tell you!). He's got much ahead of him. I really cannot say more without spoiling major things. Eureka. Beautiful, quiet, mysterious. Love-at-first-sight for Renton, who would do anything to protect her. Her development is well-presented too. Mind you, strange things are awaiting you at the end of E7, be ready for it! This girl has many secrets and lots of potential. Although, she appears to lack emotions (which Renton teaches her), but she's an adept at LFO combat. Enough here, cuz spoilers are coming if I continue. On with Holland. The master of reffing and Renton (and all kids') all-time god (hero/idol) and commander of GekkoState. Holland appears to be a fun character, and somewhat stern. However, Renton was badly mistaken. Holland is just the opposite of what he seems to be. He is like a father for GekkoState, protecting everybody and self-sacrificing for the sake of others. Midway through E7, he undergoes dramatic changes, all for the best. Talho! The captain of Gekko-Go. She is the leash for Holland, restricting his impulses and setting him in the right direction. She has a secret (ok, not so secret) crush on Holland. Hap, the everything-doer. Not much to say, but he still has quite a role in E7. Similarly, Woz (strange hat man! ), Jobs (Hitman's son? ), Gonzy, Gidget, MoonDoggie (Doggie Nii-san! LOL! ), Stoner and the others have their respective roles to play, but they are very diverse from each other, and each's development is well planned and well presented. Their emotional developments are very well introduced, smoothly and at the correct pace, giving the viewer time to digest the changes and appreciate them. There are characters on the other side (bad side) if you want, like Dominic, Anemone, the Sages the millitary and Dewey. But I can't explain about them without spoiling. Expect something Gundam Seed Destiny-like with Dewew. The others are not so bad, but take soooo long to realise it. The hierarchy is: Sages -> Dewew -> Millitary -> Dominic -> Anemone. Or something like that. As you can see, there are literally lots and lots of characters in E7, and that goes without mentioning important side characters like Diane Thurston, William B. Baxter and the others. They have important roles to play and are here to reveal parts of the E7 plot to us, in a subtle way. It allows the viewer to get a global view of E7 and from different perspectives. There is literally lots and lots to tell about E7's cast, but I leave their discovery to you. I can't spoil the fun furthur. If you haven't guessed by now, Eureka Seven is just great and I really enjoyed my watching experience. I am now going to rewatch it, just to get a clearer view of it. In fact, Eureka Seven is one of the rare anime that I have ever rewatched. And frankly, it deserves it. I would rank the rewatch value as "Very High". At the end, you will want to rewatch it from the beginning, just to watch the characters and story's evolution again, from a new and enlightened perspective. And to gain a better understanding of E7's magnificent story of course! I really, really enjoyed Eureka Seven and it is now my top favourite. It deserves this space. Eureka Seven is a masterpiece, take it from a fellow fan. Now, E7 might have some plotholes and some things that weren't elaborated extensively, just as any other anime have. But the positive aspects of E7 fully compensate for these small (tiny) losses. You won't even feel them. Nothing is perfect, but I believe E7 approaches perfection up to its nose! As summary: Rewatch Value? Very High. Enjoyed myself? I kinda went overboard! Was E7 good? Na, no good. It is simply a masterpiece! Go watch Eureka Seven!! That's all there is to say. You won't regret it. I know some people will be dissatisfied with my review, but I am just expressing my opinions. And I consider Eureka Seven to be a true success! Go watch it and draw your own conclusions. I do not think you would regret it. And I am not joking, it really deserves these "10"'s from me! Thank you for reading my review. I know it was long. If something needs elaboration, contact me. I will amend the review where needed. Sayonara and go enjoy Eureka Seven! “Eureka 7” is definitely an entertaining series even if not a great one. The artistry oozing from the animation, designs, and music may help you overlook the story’s schizophrenic inanity. The show’s supreme craftsmanship provides the spoonful sugar for its less-than-tasty story. It’s easy to watch these fifty episodes when the characters and their world are as creative and eye-popping as “Eureka 7’s.” Bolstering the shows designs and animation is one of the best soundtracks to bless a show; most impressive is the music’s ability to capture each of the story’s emotions with a perfectly mellifluous track. 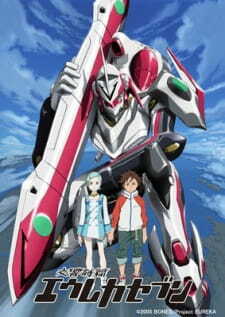 “Eureka 7” suffers mainly from an identity crisis that ends up degrading the overall story. It begins as a really fun, rebels-versus-establishment adventure set in a world where skaters and hipsters reign as the supreme good guys. I wish they creators would have stuck with this tone; it’s original and fun and would have lent itself perfectly to a. However, the show soon veers toward a melancholy, internal drama, and, before the fifty episodes are over, “Eureka 7” takes another sharp turn toward silly romance. Maybe I’m too harsh, though. “Eureka 7” is targeted at teens, and if you can successfully put yourself into the mind of a naïve, romantic teen (see every teen), it’s easier to forgive the show for its flourishes. Less forgivable, however, is the fragmentation of the story and characters caused by the shifting focus from adventure to drama to romance. Running in so many directions causes “Eureka 7” to roll its ankle, and the show never achieves any emotional impact. This is particularly disappointing since many of the characters had great potential to connect with the audience. Unfortunately, with the changes, the characters lose their original luster, drastically degrade into one-dimensional stereotypes, or drop from the story entirely. As critical as I may be, please note that I watched “Eureka 7” nearly continually at every chance I got. It is, for the most part, an enjoyable series. To best enjoy this show, appreciate the audio-visual experience and always remember the target audience is young teenagers. At first I was skeptical as to just how good this series would be and the 50 episode runtime was a bit daunting however I began watching anyway as it seemed the most interesting out of the series I have waiting. I can say that I definitely wasn't disappointed. I'm sure you've read the synopsis so I won't be mentioning that here. The story moves quicker than what you would expect from such a long series and this is a good thing as it minimizes any time where it would seem to be boring. This is even more impressive when you realize that there is next to no filler and what filler there is was entertaining and worth watching. The context of the story and the way it evolves isn't over the top or unbelievable, it unfolds at a steady pace the entire time and doesn't ever feel rushed or drawn out either. I see that a couple others have said that at times it is hard to follow but that isn't the case at all if you're paying attention and overall its an enjoyable journey with a satisfactory ending even if it left you wanting just a couple more answers. The art is definitely above average, the animation is smooth and the colour scheme works well. It is a great support for everything else and the variation in quality across the span of the series is minimal. There were times when a certain lack of shading was noticeable but they quickly passed. Its not the best around but it is very good and considering the length makes it all the more impressive. The sound is the only section i'll score a perfect 10, it really is outstanding. The music from the openings to the endings and everything in-between is enjoyable and not something you'll get sick of. Every track seems as if it could have been made to be used here and truly makes part of the show what it is. Sound effects and the like are perfectly acceptable, definitely above average. I haven't heard the dub so I can't comment on it but the Japanese voice acting fit well and no characters voice felt out of place. Overall a very pleasing experience. The characters are great, you won't see any cardboard cutouts here, each character is multi-dimensional and all add to the story. Eureka at first seems distant and not quite developed but thats exactly how she's meant to be, you find yourself waiting for scenes where she and Renton interact with eachother for this is where alot of entertainment comes from. Seeing her grow as a person from that is quite something. That leads me to Renton, an average kid by all means, at times its downright annoying how naive and childish he really is but he learns from it and by the end you can truly see how he has grown. With all of this you may be asking why I rated it only an 8, thats because of the three kids, maybe I just dislike kids altogether but they cry at the drop of a hat, mess things up due to their own selfishness and are just a plain annoyance, I found myself becoming slightly irate everytime they were on screen. However i'm sure thats how people sometimes feel around real kids as well so if they were given just a little less screen time I guess I could have brushed it off. Overall the character development is really great especially concerning Eureka and Renton, further more apart from the kids I didn't find myself disliking any character which is a testament to how well made they all really are. I watched the series in three days and it never felt like it dragged on, I was always eager to see what came in the next episode and overall I really did enjoy this series. It just has the feeling of being enjoyable, taking you on a ride and you find it hard to leave. Once again I felt the kids detracted from this but whatever shortcomings they bring are immediately made up for by the rest. Enjoyment level for this series is high. In the end its an interesting, enjoyable and great series. Don't let the length put you off, if you watch anime then this is something you should see. Eureka seveN is about saving the world! ...Eventually!! STORY - A strange girl and her mecha enter Renton’s life one day. He quickly develops a crush on her and decides to leaves his home and stay with her by joining Gekkostate, a group of outlaws and his childhood heroes. Shenanigans follow. There are vague and unclear plot developments that happen in the background, but the actual story will not really start to manifest for another twenty or thirty episodes, and even then, it’s difficult to figure out what exactly anyone’s try to do, much less how they intend to do it. Eureka seveN has some of the most frustrating and ridiculous pacing I’ve ever seen. Many of the first dozen or so episodes feel like filler — some characters are developed and some histories are uncovered, but you are pretty much following the Gekkostate around as they take odd jobs to pay for food. You know they are rebels, but you don’t know why they’re rebelling or what they hope to accomplish. People attack and they fight back. They investigate things, but there is no clear sense of purpose. As the series progresses, there are several high-tension and climatic moments, but again, thorough explanations are difficult to come by and many of the characters don’t seem to really know what’s going on either. They are just compelled to put themselves into situations without understanding why, and when each climax is over, life goes on… to even more filler-like episodes; it’s as if they’re trying to make you forget about any plot-relevant developments by inserting that pointless soccer episode. Instead of devoting time to the overall plot of the series, Eureka seveN spends a lot of time developing more general themes like religious discrimination, family relationships, responsibility, and identity. While that isn’t terrible in itself, it would have been infinitely better if plot progression (and explanation) didn’t have to be sacrificed for them (and if the characters involved were more sympathetic). CHARACTER - Renton and Eureka both start off as pretty typical archetypes — the protagonist boy who wants adventure, and the mysterious girl that you know is special for one plot device reason or another. Neither of them interested me. Instead, it was the crew of the Gekko that initially attracted me and kept me going through those opening filler episodes. Since there is so little going on plot-wise for the first half of the series, most of the focus was on character interaction and relationships. Holland, the captain, quickly establishes himself as an interesting and sympathetic character; he is the one with the rough past and a goal, even if you have no idea what that goal is initially. Talho is also sympathetic, partially because it’s rare to see characters with established romantic relationships. The rest of the ship’s crew offers little beyond the basic support roles; now and again, there were be attempts to spotlight them, but it was never anything really meaningful. Unfortunately, as the series progressed, all of the characters got more and more irritating. For someone who is supposedly fourteen, Renton’s perspective and train of thought is incredibly juvenile most of the time and the idiocy of some of his thought processes frustrated me to no end. He chooses to leave his “boring” life behind in pursuit of a girl he just met and knows nothing about and is upset when things don’t go his way. Am I supposed to sympathize with that? He is absurdly naive (can’t even realize when the entire crew is trolling him) and sometimes seems forcibly ignorant, especially when it comes to fighting and his role aboard the Gekko. Eureka is similarly clueless, though she has the excuse of not being “normal,” for whatever reason. But the most aggravating thing about the pair of them is their relationship. To some extent, there is the illusion that their relationship actually develops and matures throughout the series, but the truth is that their relationship is completely idealistic from beginning to end. Renton’s attraction starts off as just infatuation, and yet he immediately decides that he wants to follow her and “be with her.” Eureka is more ignorant, but as soon as she starts to realize it, there are no longer any doubts. Their misunderstandings are grounded in stupidity and they don’t seem to feel much conviction in their fights, implying that they are too purely “in love” to have serious disagreements. The bumps in their road are superficial at best, including Eureka’s adopted children, who have little point or personality beyond (over-)emphasizing the familial themes present throughout the series. As the primary protagonists, Renton and Eureka’s failure to really make me care about them alongside the haphazard pacing of the story makes me wonder how I managed to finish the fifty episodes series at all, since unsympathetic characters is my #1 reason for dropping series. Meanwhile, Holland also falls down the immaturity path where many of his actions and views are decidedly juvenile and illogical. A believably character flaw, certainly, but as the story refuses to allow him to explain his conflicts and frustrations in detail, it’s difficult to sympathize with the way he acts, and he just gets annoying after a while. Talho was the last character I had any respect for; her jealousies and frustrations were the easiest to deduce and thus the easiest to sympathize with, especially since she actually confronted them now and again. Sadly, the maturity of her character seems to take her out of the spotlight during much of the latter half of the series. Dewey, the primary antagonist, takes his damn sweet time coming into direct relevance since he spends the entire first half of the series lurking in the shadows and vaguely putting together his grand plan. Even when those plans are put into motion though, his motivation remains unclear until the finale, so there’s no chance for understanding or sympathizing with what he’s trying to do. In the interim, Dominic never really presents himself as an enemy and never does anything particularly interesting or relevant; most of the focus is instead on his abusive relationship with Anemone, who, aside from being obviously tsundere for him the whole time, isn’t properly explained until the last five episodes or so (and even then, not very well at all). Additional characters include Charles and Raye, who are unnervingly creepy in their parental affection, and Norb, who is an expository plot device more than an actual character (though he does have an ironic personality). ARTSTYLE & ANIMATION – Eureka seveN has some really great battle scenes, but I wouldn’t expect anything less from BONES. Everything is smoothly animated and fun to watch, so even though I has very little emotional investment in the characters and subsequently, the actual outcomes of the battles — I still liked watching them. The mecha designs are a bit reminiscent of those from Evangelion, but there’s a lot more variety between the various suits, including the way they’re piloted (especially when you consider the typeZERO VS the typeTheEND). The giant boards and surfing parallel seemed kind of ridiculous at first, but it really grew on me after a while (besides, Code Geass had rollerblading mechas, though Eureka seveN debuted first). At the very least, the concept makes flying sequences much, much more interesting, and the added danger of a pilot losing their board mid-fight is fun. The character designs in the series are simple and attractive, and I really liked that a few of the characters made a point to change their appearances at certain points in the story, usually in correspondence with a significant change in their mindset and goals. More series should do this, if only to accentuate the fact that their characters actually mature over time. MUSIC - There’s obviously a ton of hiphop influence in this series, so it was no surprise to see it reflected in the music as well. It’s always nice to mix up the game a little by injecting some atypical genres into the soundtrack, and Eureka seveN does a good job here. Additionally, there is a ton of really, really epic music that is occasionally paired with a scene that’s quite a bit less than epic, which makes things feel out of place. — those tracks would probably sound better independent of the series so they don’t seem so pretentious. About halfway through the show, I finally noticed Naoki Sato’s name in the opening credits and had an “ahha! that’s why the music is awesome” moment. The last time I heard Sato’s work was in the X TV series, where the music was its single greatest asset. It’s not quite as true here, but it’s close. To be honest, I didn’t pay attention to most of the opening and ending themes in Eureka seveN. I enjoyed the rap in the second opening, “Shounen Heart,” by Home Made Kazoku, but most of the others were pretty forgettable, especially since I’m indifferent towards most of the involved artists. All the themes were also much shorter than usual — they hovered around thirty seconds in length, rather than the usual minute. VOICE ACTING – I saw this series dubbed, which probably further contributed to my lack of sympathy towards Renton. I didn’t realize that Johnny Yong Bosch was Renton for a long time since the voice was incredibly different from his other roles. Renton sounds (and acts) incredibly young, and his voice was both over-the-top earnest, naive, and whiny. On one hand, it’s actually an incredible fit for the character; on the other hand, it was annoying as hell, especially when coupled with lots of fail dialogue. Stephanie Sheh as Eureka was also rather fitting, but much less irritating. Honestly, the dub cast did a great job: each voice was distinct and unique, and every voice fit their character very well. Crispin Freeman as Holland was pretty badass in particular. Still, there was a quite a bit of awkward dialogue and word usage. A lot of lines were unnecessarily corny or just outright awkward (like, “Mm, smell that? That’s the smell of your Papa!” “…It smells good.”) though that can obviously be attributed to awkwardness in the original script. I found the use of “Mama” and “Papa” in place of “Mom” and “Dad” kind of strange though, and it sounded unnatural coming from a lot of the characters, especially Renton. Lastly, there are a handful of slips in the pronunciation of “Eureka” throughout the series. Most are by minor characters and not particularly notable, but it’s an indication of sloppiness all the same. OVERALL - Given all the positive recommendations I’d gotten for this series, I’m pretty damn disappointed with how things turned out, especially since the finale revealed that the story could have been ten times more interesting if presented in a more efficient manner. The pacing, along with the quick evaporation of my sympathies towards the cast, really destroyed the little enjoyment I was getting from technical aspects of the show. I really wanted to drop the series around the halfway point, but I figured I’d already invested so much time into it, I might as well finish it (what a stupid train of logic rarely does it reward you in the end). A recap movie of this series might work a lot better since it would, theoretically, cut out a lot of the excess filler crap and force the actual plot out into the open much faster. The recently released Eureka seveN movie, Pocketful of Rainbows, isn’t a recap movie though, so I’m not going to watch it. I’ve had enough of rainbows. Mecha anime shows will never go out of style. Giant robots piloted by feisty teenagers or grizzled heroes is just such a cool concept. Let's take a look at ten of what I think are the best!